Aerial view of Taholah’s Lower Village. TAHOLAH – On March 25, the encroaching waters of the Pacific Ocean awakened residents in Taholah, Washington, when their aging seawall was breached and flooded sections of their Lower Village. Now, the village is faced with relocation due to changes in climate resulting in rising sea levels, tsunami threats, and flood danger from the Quinault River. The ancestral home of the Quinault people is classified as a tsunami hazard zone by the Washington Emergency Management Division and is no longer considered safe. As a result, a comprehensive master plan is being implemented that would move residents and government structures 120 feet above sea level to the Upper Village. The risks were identified years before when the Quinault Indian Nation undertook a comprehensive analysis of the coastline after increased flooding in the Lower Village. The analysis showed deterioration of the protective berm that separates the Lower Village from the ocean water. With each large storm the ocean encroaches further into the village, making relocation necessary. “We first thought it was rain water, but in 2009 we did a walk down to the ocean line and we discovered the ocean was encroaching much worse than we thought,” said Councilman Larry Ralston, Quinault Indian Nation Treasurer. What was uncovered was the deterioration of a protective berm that separated the Lower Village from the ocean water and with each large storm, the ocean encroached further into the village, making relocation necessary. 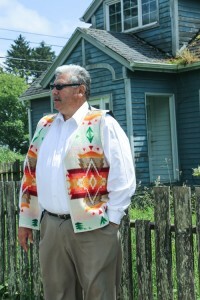 Larry Ralston, Quinault Indian Nation Treasurer, stands in front of his mother’s house which will not be moved during the relocation of Taholah’s Lower Village, and could face possible demolition along with other buildings that cannot be moved. 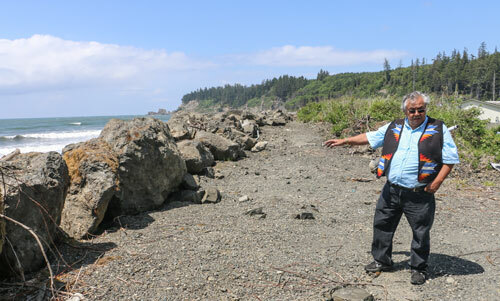 into the earth,” said Fawn Sharp, Quinault Indian Nation President. “As of right now we are in the process of undertaking a feasibility study. The study will fully assess the infrastructure and the number of residents at risk, putting together a plan that we can then take to federal appropriators and members of congress, and other federal agencies in an effort to relocate the village,” said President Sharp. Preliminary estimates for relocation cost are near $65 million and include the need to acquire land adjacent to the Upper Village, and the building of infrastructures including roadways, utilities, housing, and businesses. The loss of generational history that holds cultural relevance to the Quinault people is something that is also being considered, as is the risk of the “big one” hitting. 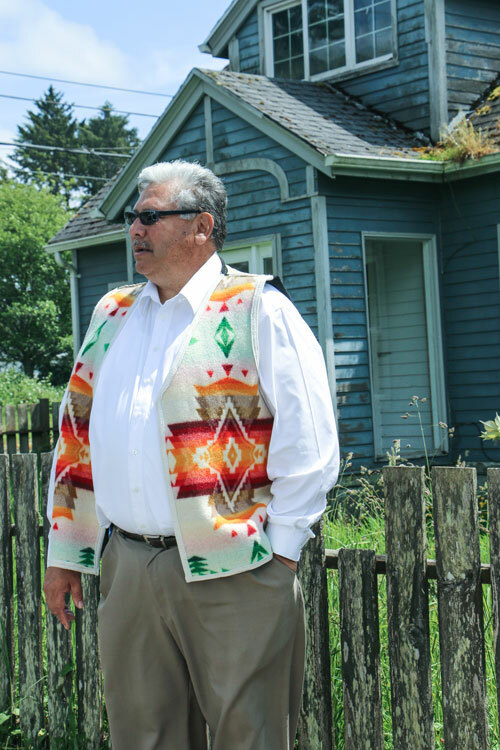 Quinault elder James DeLaCruz Sr. stands by the recently reinforced Taholah seaswall, is among the handful of residents who do not plan to leave the Lower Village during Taholah’s relocation. With only two ways in and out of Taholah, the risk of liquefaction puts residents at a high risk during evacuation, as roads would be inaccessible. During the event of a tsunami wave residents have limited time to move to higher ground. Tsunami warning systems in place in Taholah include a siren monitored by the National Oceanic and Atmospheric Administrator headquarters in Seattle. In the event of an earthquake or tsunami wave the siren will go off followed by a voice telling residents to evacuate. To date, the siren has only been used during monthly test drills. Although relocation is necessary, residents will not be forced to move. Some residents like Quinault elder James DeLaCruz Sr. knows he will not be relocating. His house butts against the seawall, and as he explains “The Lower Village has been a part of my life as long as I can remember and this is where my home is until nature changes that. 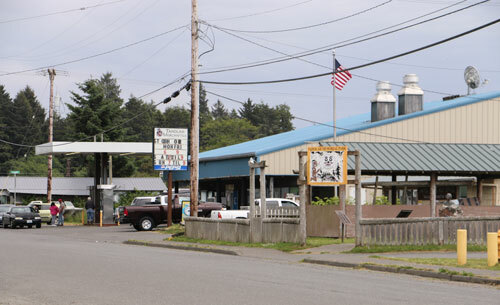 Taholah Mercantile, a Quinault Indian Nation enterprise, is the main, and only, source of perishable food shopping for residents in the Lower Village. It sits a block from the seawall and is at risk of flooding from rising sea levels. 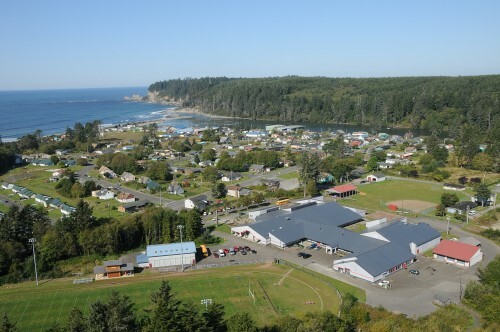 The Taholah Relocation Master Plan includes the Quinault Planning Development and Kaul Design Associates. A three-year planning process will be implemented in phases and include gathering information, needs and choices of the community, and final plan preparation.